Edinburgh coach Alan Solomons is to examine video evidence of a high tackle on Damien Hoyland during their side's 30-23 defeat by Leinster. The Scotland cap was stopped in his tracks by the shoulder of opposite wing Fergus McFadden as Edinburgh threatened a comeback in the closing minutes. "Certainly, from what I saw, it was definitely high," said Solomons. "I have not had a chance to study it properly. I'd have to look closely at the film to make any further comment." 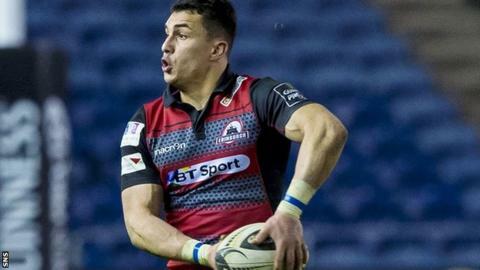 Italian referee Marius Mitrea did consult the TMO before awarding a penalty, which was converted by Sam Hidalgo-Clyne to pull Edinburgh to within seven points of their hosts. But McFadden escaped even a yellow card despite the away support calling for a red. "The penalty was clearly justified," Solomons told BBC Scotland. "There was no question about that." Despite their hosts still having a full complement of players, Edinburgh pushed deep into the Leinster half for a score that would level the match in the dying seconds. However, Leinster held on to move five points clear of Irish rivals Connacht at the top of the Pro12 table. Edinburgh are sixth, equal on points with Munster and two behind Ulster, but the two Irish sides have a game in hand. Despite that, Solomons was pleased with his side's display considering he had to play a number of players out of position after the break because of first-half injuries. "The side showed tremendous courage and character," he said. "We had a 6-3 split and we lost both our centres at half time. "The boys gave it a go right from their own try-line to get the bonus point for a draw and a bonus point for a fourth try. "Our attack is continuing to evolve and it was really positive for us from an attacking perspective, but Leinster did get four tries. "But they are top of the log and to come away with a bonus point speaks volumes for the team."